Putting Amateur Sports in the Spotlight. In September 2018, 133 Canadian Junior Hockey League franchises stepped on the ice for their quest to Brooks, Alberta in May 2019 for the chance to hoist the Royal Bank Cup national championship trophy. 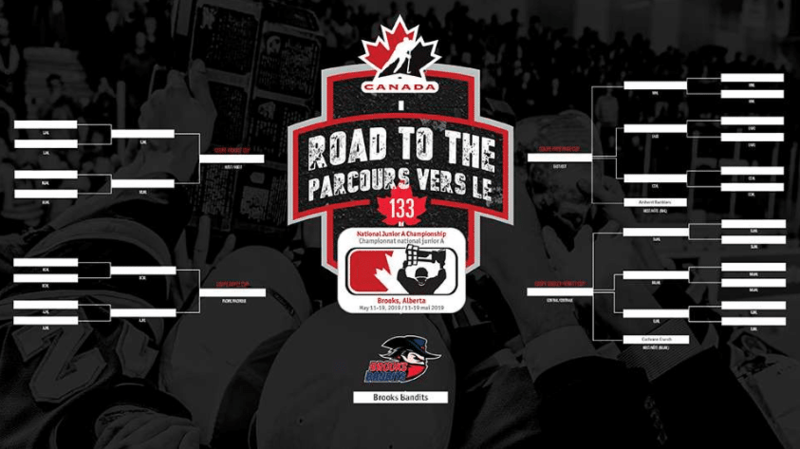 On April 15th, 20 teams were remaining in the hunt for their league championships for the chance to represent their respective league in the nation’s regional championships this spring across Canada to join the Alberta Junior Hockey League’s Brooks Bandits. As of April 22nd, there are only 15 junior ‘A’ franchises that remain in their quest of the national championship. On April 8th, 34 teams were remaining in the hunt for their league championships for the chance to represent their respective league in the nation’s regional championships this spring across Canada to join the Alberta Junior Hockey League’s Brooks Bandits. As of April 15th, there are only 20 junior ‘A’ franchises that remain in their quest of the national championship. “First impressions are the most lasting,” Proverbs. A day and a week after his team was eliminated from the NCAA West Regional by American International, former St. Cloud State forward Ryan Poehling made his NHL debut with the Montreal Canadians. Let’s just say, Poehling had a fabulous night. The Habs had to be impressed. Poehling would score a hat trick and the game-winning goal in the shootout to lead the Canadians to a 6-5 victory. Maybe it’s only fitting that Poehling would make his NHL debut during Bob Cole’s final Hockey Night in Canada broadcast. “What an unbelievable start to a career,” Cole said. So, on Saturday night, we welcomed a new player to the NHL and said good bye to a Hall of Fame hockey play-by-play announcer. Poehling’s debut with the Bleu Blanc Rouge may be a preview of things to come next season. According to the Globe and Mail, Poehling, became the fifth Canadiens player in franchise history to score at least two goals in his NHL debut. The Lakeville, MN native was drafted 25th overall by the Canadiens in the 2017 NHL Entry Draft. In three season with the Huskies, Poehling scored (29g-46a—75pts), he was also a plus-eight. One of the main tools we will use when publishing the final rankings later this month are players who are trending upwards as the season has progressed. I have broken down the entire WEHP list into several segments to give a snap shot at who performed better as the season has progressed and visa versa. Here is a look at some of the top players within the top 100 and their production since 2019 began! The first column is the players production in the 1st half and the 2nd column is the 2nd half. On April 1st, 43 teams were remaining in the hunt for their league championships for the chance to represent their respective league in the nation’s regional championships this spring across Canada to join the Alberta Junior Hockey League’s Brooks Bandits. As of April 8th, there are only 34 junior ‘A’ franchises that are still remaining in their quest of the national championship. Friday, April 6, 2018 was a day that shook the Humboldt Broncos, their families, loved ones, the community of Humboldt, Sask., the Saskatchewan Junior Hockey League, the Canadian Junior Hockey League, Hockey Canada, the entire hockey world and country, along with so many more, to its core. One year has passed since this unspeakable tragedy and the entire CJHL and its 133-member clubs would respectfully like to take pause on this day in reflecting, remembering and honouring of all those affected. 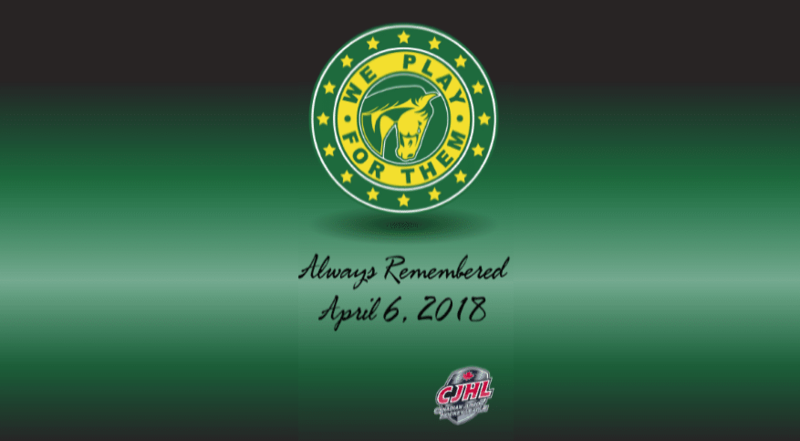 To everyone involved, from the players, staff members, the families and loved ones and all those associated with the Humboldt Broncos, you’ll forever be in our hearts and your memories live on and will never be forgotten. In the grips of grief and in true Canadian and Saskatchewan spirit, the Broncos and the SJHL honoured and recognized their loved ones with tremendous compassion, pride and reflection. Our continued support and admiration also goes out to all the first responders, emergency services personnel as well as to anyone who went above and beyond the call of duty on this day, be it on staff or civilian, and continue to do so on a daily basis. Calgary, Alta. – Hockey Canada has named nine Western Hockey League players to their training camp roster for the upcoming 2019 IIHF U18 World Championship, scheduled for April 18-28 in in Örnsköldsvik and Umeå, Sweden. From the 23-player roster, WHL players will represent two of the three goaltenders, three of the seven defencemen, and four of 13 forwards. WHL players on the roster include forwards Dylan Cozens (Whitehorse, Yukon / Lethbridge Hurricanes), Peyton Krebs (Okotoks, Alta. / Winnipeg ICE), Brayden Tracey (Calgary, Alta. / Moose Jaw Warriors), and Connor Zary (Saskatoon, Sask. / Kamloops Blazers). On defence, Daemon Hunt (Brandon, Man. / Moose Jaw Warriors), Kaedan Korczak (Yorkton, Sask. / Kelowna Rockets) and Braden Schneider (Prince Albert, Sask. / Brandon Wheat Kings) will represent the WHL. Goaltenders Dylan Garand (Victoria, B.C. / Kamloops Blazers) and Taylor Gauthier (Calgary, Alta. / Prince George Cougars) were named among the team’s trio of goaltenders. 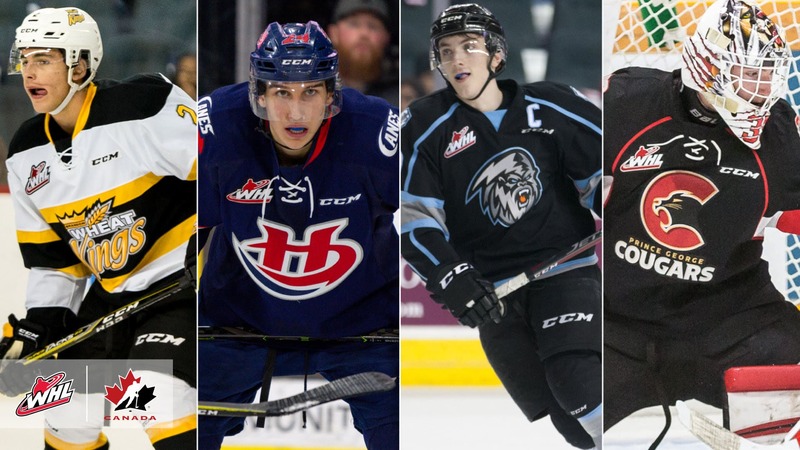 This year’s roster includes several players high on the radar for the 2019 National Hockey League Draft. Of the WHL players attending, Cozens ranks as the top draft-eligible prospect, ranked third in North America by NHL Central Scouting. Krebs is ranked eighth among North American skaters. Also on the radar for the NHL Draft is Korczak, ranked 31st among North American skaters while Tracey is ranked 73rd. Gauthier is ranked fifth among North American goaltenders. Of the 23 players on this year’s roster, eight won gold with Canada’s National Men’s Summer Under-18 Team at the 2018 Hlinka Gretzky Cup, including Cozens, Gauthier, Krebs, Korczak, and Schneider. Fourteen players also made their way onto the roster via participation in the World Under-17 Hockey Challenge, including Cozens, Gauthier, Krebs, Korczak, Schneider, and Tracey. Garand and Hunt, who have also played at the World Under-17 Hockey Challenge, represent a pair of underage players selected to the roster in order to gain international experience. In addition to the nine players, the WHL will be represented on the team staff by Alan Miller (Tottenham, Ont. / Moose Jaw Warriors) who is serving with the team’s management group, assistant coach Dave Struch (Flin Flon, Man. / Regina Pats), goaltending consultant Adam Brown (Kelowna, B.C. / Kelowna Rockets), and team physician Dr. Barry Wiens (Red Deer, Alta. / Red Deer Rebels). Over the next week, Hockey Canada and team staff will continue to monitor the Canadian Hockey League playoffs and can invite additional players to training camp before a final roster is named ahead of the tournament. Players will gather in Kisakallio from April 8-12 for five days of practice before heading to Sweden for two pre-tournament games – April 14 versus Belarus in Umeå and April 15 versus Russia in Örnsköldsvik. Canada will look to claim gold for the first time since 2013 when it kicks off its tournament schedule against Finland on Thursday, April 18 at 1:30 p.m. ET/10:30 a.m. PT. Canada will also match up against Switzerland, Belarus and the Czech Republic in the preliminary round before the tournament wraps up with the bronze and gold medal games on Sunday, April 28. TSN and RDS, Hockey Canada’s official broadcast partners, will broadcast 15 games, including all of Team Canada’s match-ups at the IIHF U18 World Championship, all quarter-finals, both semifinals and the bronze and gold medal games. For more information on Canada’s National Men’s Under-18 Team, please visit http://hockeycanada.caHockeyCanada.ca, or follow along via social media on Facebook, Twitter and Twitter.com/HC_Men. Calgary, Alta. – Delivering the sights, sounds and stars of the Canadian Hockey League to viewers across Canada, Sportsnet is set to deliver exclusive national coverage of the 2019 WHL Playoffs, beginning this week, featuring three games between the Prince Albert Raiders and Saskatoon Blades. As Canada’s Home of Hockey, Sportsnet drops the puck on its 2019 WHL Playoffs coverage with Game 1 of the best-of-seven, second-round series between the Raiders and Blades on Friday, April 5 at 7 p.m. MT (Sportsnet 360) from the Art Hauser Centre in Prince Albert. Sportsnet will continue its second round coverage of the 2019 WHL Playoffs by carrying Game 2 between the Raiders and Blades on Sunday, April 7 at 6 p.m. MT, once again from the Art Hauser Centre. The Sportsnet broadcast schedule for the 2019 WHL Playoffs will close out Tuesday, April 9 at 7 p.m. MT with Game 3 from the SaskTel Centre in Saskatoon. Returning to provide the latest news, analysis and insight to fans across Canada is play-by-play announcer R.J. Broadhead, game analyst Sam Cosentino and host Rob Faulds. The Prince Albert Raiders finished 2018-19 as winners of the Scotty Munro Memorial Trophy – awarded annually to the WHL’s Regular Season Champions. Led by 2019 NHL Draft prospect Brett Leason (Calgary, Alta.) and Toronto Maple Leafs prospect Ian Scott (Calgary, Alta. ), the Raiders advanced to the second round of the 2019 WHL Playoffs after defeating the Red Deer Rebels in four games. 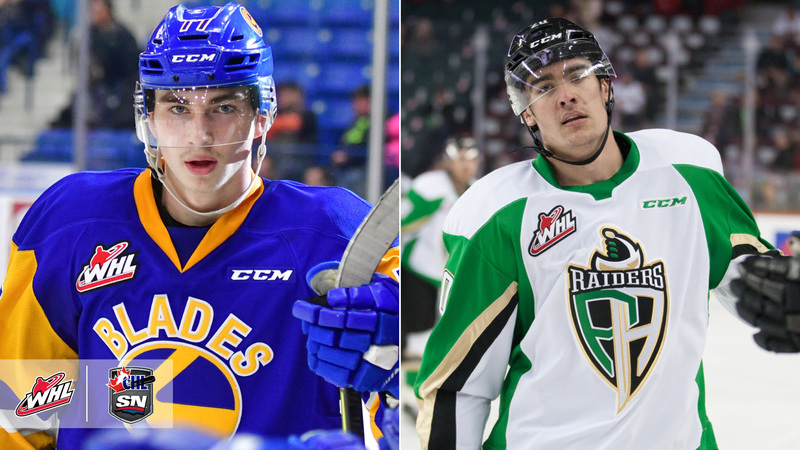 The Saskatoon Blades finished the 2018-19 WHL Regular Season in second place in the East Division, trailing only the Raiders. Led by 2019 NHL Draft prospect Kirby Dach (Fort Saskatchewan, Alta.) 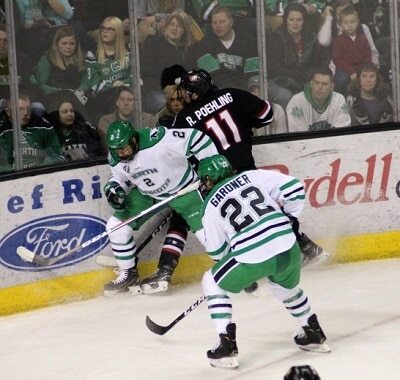 and Washington Capitals prospect Eric Florchuk (Fort Saskatchewan, Alta. ), the Blades advanced to the second round of the 2019 WHL Playoffs after defeating the Moose Jaw Warriors in four games. In addition to Sportsnet’s coverage, all games throughout the 2019 WHL Playoffs will be available streaming live at WHLLive.com. Sportsnet is Canada’s #1 sports media brand. Uniting Canadians through sport, Sportsnet’s multimedia offerings include Sportsnet (consisting of 4 regional channels: East, Ontario, West, and Pacific), Sportsnet ONE, Sportsnet 360, Sportsnet World, the Sportsnet Radio Network, Sportsnet.ca, Sportsnet NOW, the Sportsnet app, and podcasts. Sportsnet is the official Canadian NHL national multiplatform rights holder, and is the regional broadcaster for the Vancouver Canucks, Calgary Flames, Edmonton Oilers, and Toronto Maple Leafs. Sportsnet also has extensive coverage of the Blue Jays, as well as NBA, MLB, Grand Slam of Curling, Rogers Cup, CHL, IndyCar, WWE, Premier League, and FA Cup. Sportsnet is part of Rogers Media, which is a subsidiary of Rogers Communications Inc. (TSX, NYSE: RCI). Visit Sportsnet.ca. The first round of the Canadian Hockey League playoffs is all wrapped up following Tuesday, April 2nd four game sevens with 24 Canadian Hockey League teams still on their quest for a chance to hoist the 2019 Memorial Cup presented by Kia and hosted by Halifax Mooseheads from Friday, May 17th and ends on Sunday, May 26th. 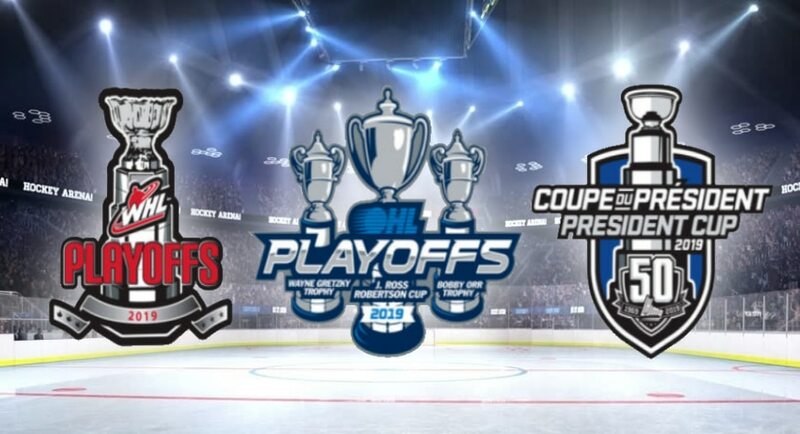 All 12 Canadian Hockey League semi-final conference finals will open up on April 5th across the country in the Western Hockey League, Quebec Major Junior Hockey League and the Ontario Hockey League including the Soo Greyhounds facing the Saginaw Spirit in Saginaw, Michigan on April 5th with a 7:05 p.m puck drop. © 2019 AmateurSports.tv. All Rights Reserved. Website design by 20/20 Marketing.